Sagittal synostosis is a common form of synostosis. The sagittal suture shows premature fusion which leads to restricted transversal growth of skull. 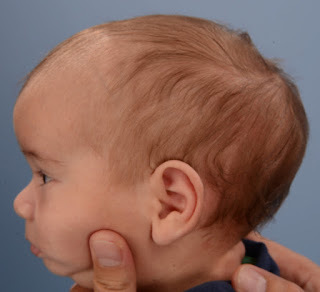 Due to restricted transversal growth, skull started growing backwards I.e. anteroposterior growth to accommodate the whole brain. The skull appears boat shaped that's why it is called as boat skull appearance. Scaphocephaly is another name of sagittal synostosis. There is an exaggerated occiput and frontal bossing that makes it appear boat shaped. There are 50 percent chances of sagittal synostosis of all cases. It occurs in approximately one person out of every 2000 people with synostosis. It is an asymptomatic condition. A bony ridge is visible at the back side of head. The forehead is wide with exaggerated occiput. The back side of head is quite prominent. There are only two problems which may occur I.e. delay in speech and language. There may be increased intra cranial pressure. Children with sagittal synostosis tends to speak later than usual. So speech and language therapy helps a lot in motivating children. Increased level of intra cranial pressure is observed in children of age 5 or 6 years. But it occurs in rare cases of sagittal synostosis with no exact reason behind it. Cause of sagittal premature fusion is still unknown. It may be genetic because it can transfer from parents to their infants. The exact defective gene is not identified yet. It occurs during fetal development within the womb of mother. The position of baby also matters a lot. As inaccurate position of fetus head can cause sagittal synostosis. The research is still ongoing to identify the causative gene. It is not acquired because it is present by birth. The skull appears dome shaped or boat shaped from the back side of head. Surgery is the only treatment option. There are two main types of surgeries used i.e. strip craniectomy and subtotal cranial reconstruction. A small cut or full head open cut is made in case of strip craniectomy. A ventricle cut is made along the sagittal fusion and sometimes small horizontal cuts are also made to make surgery easy. After surgery, head molding helmet is recommended to make the shape of head. In case of subtotal cranial reconstruction, cut is made on the posterior side of head. Head contouring occurs on its own and no helmet is required. As there are only two main surgeries performed and safety profile of subtotal cranial reconstruction is high. As limited area is made open and no contouring is required. No helmet is required to make its shape but it repairs on its own. Surgery should be performed in growing age because growth factor is necessary for repair. And growth should be from all sides of skull i.e. anterior, posterior or both. In subtotal cranial reconstruction, the skull repairs completely within 6 .months of time period but in case of strip craniectomy, it takes more time to repair completely.